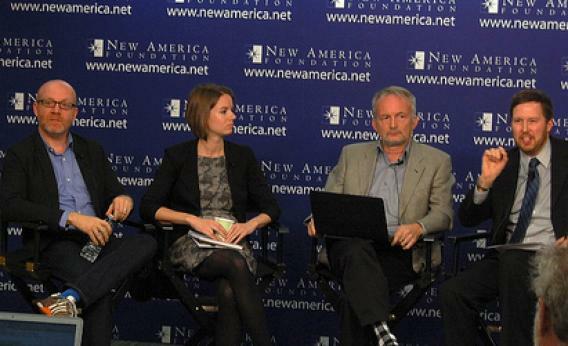 Future Tense event recap: Who Should Govern the Internet? Who Should Govern the Internet? A Future Tense Event Recap. You may have heard that at a summit next week, the International Telecommunications Union, a U.N. agency, will attempt to wrest control of the Internet. At a Future Tense event on Internet governance this morning, held at the New America Foundation in Washington, the rumor was soundly spanked by a host of experts. In reality, they said, the upcoming World Conference on International Communications in Dubai will likely just lead to … more conversation. But maybe there’s a silver lining to all of this bipartisan fear-mongering (or, as Open Technology Institute Director Sascha Meinrath termed it, “the uber-geek [equivalent of] Red Dawn”): “Suddenly everybody’s interested in global governance of the Internet,” said Syracuse University professor Milton Mueller. “If it was necessary to lie to people and tell them the ITU was going to take over the Internet, maybe it’s a good thing.” Indeed, Temple University law professor David Post, author of the amazingly titled book In Search of Jefferson’s Moose: Notes on the State of Cyberspace, observed that right now, it feels a bit like six months before the SOPA protests blew up: We are on the verge of Internet governance issues crossing over into mainstream discussion. But if the U.N. isn’t going to “take over” the Internet, does that mean the Internet can just keep humming along the way it has been? Not quite. Right now, we are stuck between an “old governance structure and a new one,” American University’s Derrick Cogburn argued. We might not quite know yet the form the new one should take, but there are a lot of reasons to jettison the old. For one thing, the ITU can serve as a way for authoritarian regimes’ strict Internet controls to gain international legitimacy. Jim Cicconi, who is senior executive vice president for external and legislative affairs at AT&T, put it this way: “The danger is not that the ITU takes over. That’s not what AT&T’s worried about. What we are worried about is it provides a legal underpinning for nation states being much more oppressive, much more controlling about the Internet. Even authoritarian governments look for international legitimacy for their oppressive actions,” he said. (Of course, as Mueller pointed out, we Americans can’t forget about surveillance on our own turf.) In fact, as word came that the Internet had been shut down in Syria, Andrew McLaughlin, who has worked for Tumblr and Google and served as deputy chief technology officer for the U.S. in 2009-2011, noted that the ITU constitution actually does not prohibit such actions. Furthermore, the ITU and other organizations often fail to represent the actual people who use the Internet on a daily basis. Mueller noted that it is tied to governments, which can’t be trusted to always have in mind the best interests of the citizens they are supposed to represent. (As New America fellow Rebecca MacKinnon pointed out later, the discussion surrounding this issue can be problematic, too: It’s not good enough for the United States to say that Brazilian government doesn’t represent Brazilian Internet users. Brazilians need to be able to do that themselves.) And it’s not just about nation-states: According to Arizona State University’s Jonathan Koppell, author of the book World Rule, the ITU is heavily influenced by corporations, whose representatives are frequently found on the ITU’s “study groups” devoted to researching particular Internet-governance topics. A frequent critique of Internet governance today is that the United States wields too much influence and that developing countries are left out of the conversation. Sometimes, that can be literal: Cogburn and others noted that it is “really, really expensive” to travel to Baku, Azerbaijan, and other far-flung places that host Internet governance conferences. But “the Internet must work globally, not just in the U.S.,” he said. So if that’s what’s wrong with the system today, where should we look next? McLaughlin believes that the United States should make dismantling (or, as he put it more colorfully at one point, “kneecapping”) the ITU an official policy objective. He believes that there are a small number of things the ITU can and should do—but it certainly should not be given more power. Ellery Biddle of the Center for Democracy and Technology believes that we shouldn’t abandon the idea of global policymaking around Internet issues altogether. “Technical standards are essential,” she said. But when it comes to more human issues, like surveillance, even voluntary standards can be tricky. Instead, she would prefer that we look to established documents like the Universal Declaration of Human Rights. “You Got a Better Idea? ICANN is the worst solution to Internet governance, except for all the alternatives,” by Jonathan Koppell. “ICANN, Make a Difference: The $100 million raised by the sale of new Web domains should be used to wire Africa,” by Sascha Meinrath and Elliot Noss. “The Real Threat to Internet Freedom Isn’t the United Nations: Governments are cooperating on surveillance in other, less obvious ways,” by Ryan Gallagher.